I don’t know if I’ll be able to sleep tonight. This handsome young donkey’s name is Buck, and he’s coming to join the Morning Bray Farm herd tomorrow. In July, Buck was one of a herd of 11 donkeys rescued from a feedlot for slaughter-bound horses located about 20 minutes from Morning Bray Farm. The wonderful couple who rescued Buck along with 10 other donkeys stepped up because the nearby rescues were all full or otherwise unable to take in foster donkeys. Because they thought he looked like a little deer, Dorothea and Andrew named him “Buck”. From the beginning, they could see that Buck has a wonderful personality and an immensely strong will to live. Buck is pretty young and somewhat delicate; he has a formerly broken hind leg, uncared for and grown back together in a crooked way. It turned out that Buck was one of the most skittish and untouchable of their rescue donkeys, and one who was in urgent need of a hoof trimming. Because of Dorothea’s and Andrew’s patience, compassion, and care, Buck is now quite touchable, and his feet have since started toward recovery. Minus Buck and another gelding named Gustave, their rescued donkeys are heading to sanctuaries in California, Nevada and Texas over the next several weeks. Because Gustave needs a negative Coggins before he can travel, Dorothea and Andrew will work to gentle him over the winter. We have no doubt that Gustave will be eating Paco treats out of their hands in no time. Dorothea and Andrew, you did a wonderful, wonderful thing. Thank you for bringing them all back to life, and thank you for allowing us to give Buck a loving forever home. He is a pretty one! It will be interesting to see how he integrates into the herd. How wonderful! Can’t wait to see how this will change the lineup! Horray, another Morning Bray Farm adoption!! We all feel like Aunties and Uncles, welcoming another Lucky Buck to his forever home. He’s beautiful! Looks a little like Big Red from the pictures. Oh, Buck is SO adorable….a little Bambi like boy 🙂 Can not wait for photos of his joyous homecoming ………..
Bless his poor little heart! He’s beautiful! And he needs the love and safety of yourfsrm so badly. I can’t wait to see him blossom. Come see my beautiful little molly if you like sometime. The family is growing! I can’t wait to get my life started in Arizona so I can start my donkey fmily! Ohh, look at his poor little leg! He’s probably fine with it, all adjusted, but it makes MY heart break! He must be a tough one despite his delicate, deery appearance. Congratulations Morning Bray Farm. Yes another Auntie here, looking forward to pictures of the new baby of the family. ((Happy tears))! Welcome Buck, to donkey heaven-on-earth! Another one? Good for you, and good for Buck! I think you need to get your nonprofit status and become a full-fledged rescue! Aw, Buck. He looks like such a sweetie. I hope everything works out okay with all of the other donkeys and Gustave. Bless your hearts! He sure is an interesting color, and we will all enjoy watching his story unfold. You are doing a marvelous thing !!! Saving precious souls. He’s beautiful! 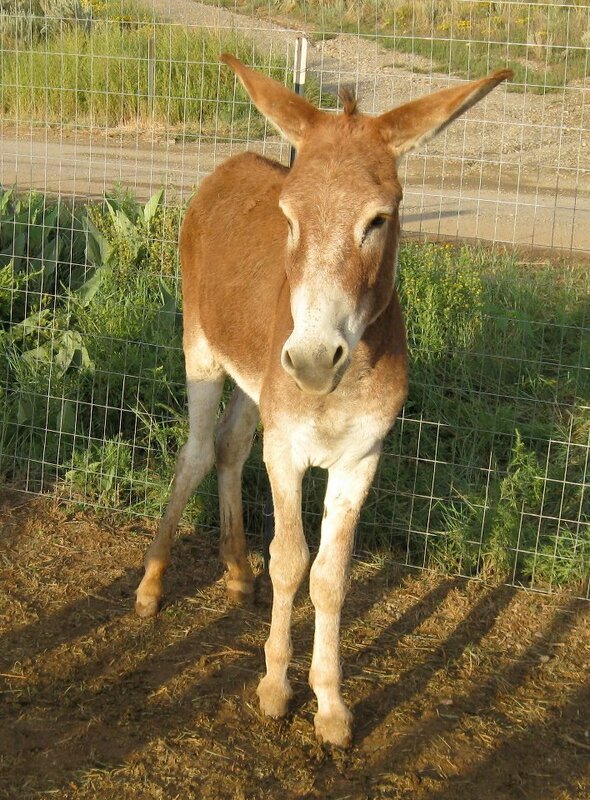 You have such a gentle, loving family of donkeys. I send my love to all of you. How can he be so adorable? I am so looking forward to getting to know him better and I am really excited for you! What a handsome little guy! I’m sorry about his leg – is he able to run and jump and gambol around like the others? You, Don and the kids are AWESOME!!! Can’t wait to see more photos and hear about Buck’s arrival at Morning Bray Farm. Oh what a sweet sweet little boy! It breaks my heart that someone would not care for their animals and let a boys broken leg heal untended. He Must have a stong will to survive and was just looking for MBF so he could choose his forever family. He doesn’t know he’s about to land at the land of honey!!! Thank you for doing all you do rescuing these sweet babies. Thanks so much for the kind words, Justina. And thanks to you both—as well as congratulations!—for taking this wonderful guy into your herd. Tomorrow will be a day of mixed feelings for Dorothea and me. We’re just so happy to see him going into such a loving environment, but we’re really going to miss the sweet, affectionate little guy. As you’ll find, Buck-hugs are the best, and don’t forget the kisses on the forehead! They’re a must for him! Congratulations! Buck looks beautiful and will be very happy at Morning Bray Farm! He does look like a dear…. er, I mean deer! I think he is a lucky Buck, indeed! What a sweetie and how tough to have had a broken leg that didn’t heal correctly. Makes my heart go pittypat with happiness for Buck and his new family. He’s a very fortunate boy to have been rescued by Andrew and Dorothea and now adopted by you and Don. Looking forward to seeing him meet his new sister and brothers! Oh, I am SOOOO excited!!!! How old is he, Justina? He looks super young. His feet look really good to me in this picture. Dorothea is an angel. Yay… you now have half a dozen donkeys…oh my!! It’s time for a party! Buck’s feet do look good now, and he is very touchable… he’s such a sweetheart. 🙂 Dorothea and Andrew did a phenomenal job with this entire herd. Yes, it’s definitely time for a party! We *love* you too!!! Oh Justina, what wonderful news are this? Such a big surprise! What a sweet sweet boy he is. He is really colored like a deer. So big question: What place will he choose in the daily line up? That’s so exciting! Having a young one will also up the ante for adventures with the other. Can’t wait for pix and stories. Jane, your comment about Justina running out of room on her header made me laugh!! What a wonderful “problem” to have, huh?